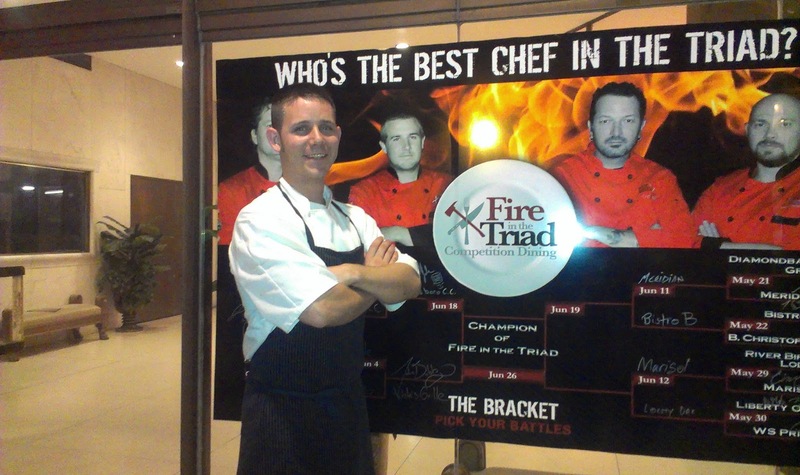 Tuesday night was the second QUARTERFINAL Fire in the Triad dinner between Chef John Bobby of Noble's Grille in Winston-Salem and Chef Juan Guzman of J. Pepper's in Kernersville. A Forsyth County showdown between two young chefs. Both went headfirst into the flames with sharp knives and induction burners blazing down at the kitchen of the Empire Room in Downtown Greensboro. Both chefs, just barely past a quarter of a century old, came from humble beginnings and have lots of passion behind their cooking styles and techniques. Chef Bobby started working in construction and decided to change careers and become the chef that he is today. Chef Guzman started as a dishwasher and cooking for himself in Mexico. After stints in culinary school and different restaurants, you see the results of both chefs' labor here today. The local professional guest judges for the night: David Bailey, senior editor of O.Henry Magazine, Kelly Davis of FoodieFresh food blog and Leah Wolfe, Southeast Regional Manager at Kabobs, Inc. The night's featured ingredient had everyone swooning, swaying and anticipating the onslaught of dishes to come: Chocolate! Chocolate from Mona Lisa Chocolate in Hendersonville, NC. White, dark and milk chocolate was available to each chef. Bacon is always a crowd-pleaser. Bacon + Lobster = Marriage Proposals. The chilled dish featured a nice, light piece of lobster, shaved fennel, a large piece of candied bacon and a luscious, unctuous white chocolate bechamel sauce. The sauce was smooth, thick, slightly sweet with the subtle spice of white pepper. 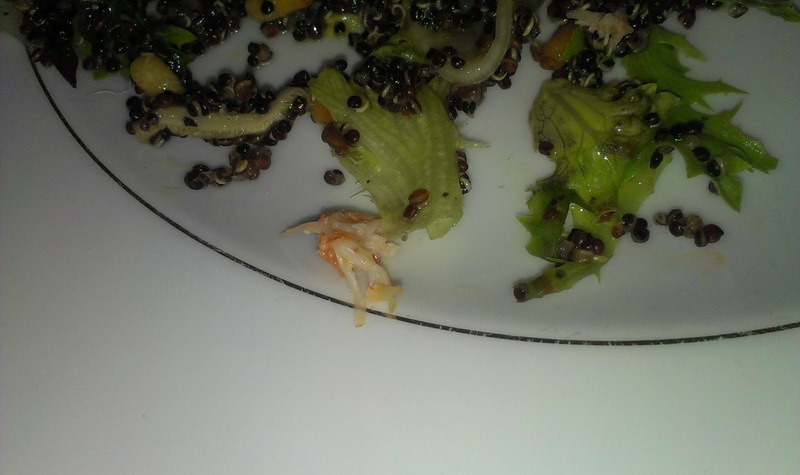 The quinoa was cooked just enough to prevent it from tasting like poppy seeds and prepared well enough to add texture to the lettuce of the salad. Unfortunate for me, I did not receive any lobster on my semi-modified plate sans pine nuts. Well, my plate arrived with pine nuts, but no lobster. I had an incredibly lean, modified plate. Wait. Yes, I did get some lobster. See below. There it is! My lobster. I will note that I am no longer a voting member of the dining public. Since the advent of the quarterfinals, I decided to go back to the kitchen and see the culinary action up-close and personal. Since I am privy to the ingredients and know what team is responsible for each course before dinner begins, it would be grossly unfair to vote. Stay tuned next week for an all-access kitchen exposé about the Day in the Life of a Competition Dining team. Have you ever stood over a smoking hot grill and still smelled of smoke hours after showering? This dish made me feel like I was eating in the smokehouse. The smoked bacon was strong, woodsy, deep, dank and it was as if you could smell the color brown. It permeated every taste bud, nose cilia and skin of my palate. The barley-agrodolce salad was dressed with a sweet and sour sauce, similar to a gastrique but with noticeable pleasantly subtle bitter undertones. So nage means "to swim" in French and the nage was swimming with the current and matched with the smokiness of the dish. 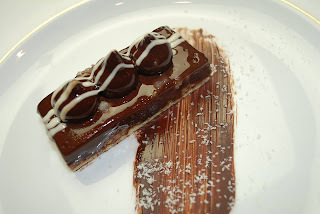 The unlisted garnish was a potato chip drizzled with white and milk chocolate stripes. Anything dipped in chocolate is desirable and this pork dish was no exception. No smoke and mirrors here, this pulled pork was straight up spicy, rich and delicious. This was my favorite course of the night. A sucker for anything spicy, this dish hit on all cylinders. The braised pork shoulder was bathed in a deep, dark, rich, smoky sauce that had subtle bitter chocolate undertones. The sweet potato puree was a perfect sweetness and texture to give the palate a break from the heat and intense flavor of the pork. The apple gremolata cut the fat and spice of the pork, giving another layer of flavor. If you were worried about the gremolata being too sweet, the pickled vegetables entered the scene and brightened up the dish with sweet and sour nuances. Last, but not least, the grilled flatbread was crispy, smoky and fresh. The smoke from the bread (my achilles' heel) added an additional layer of smokiness to the pork hitting you again from the blind side. 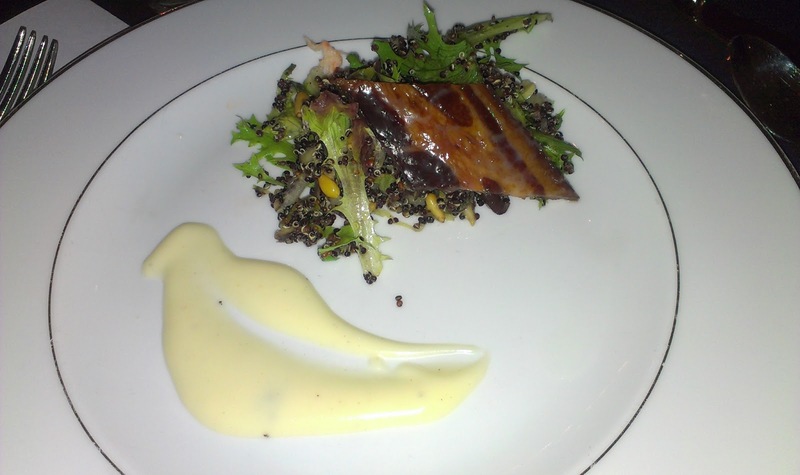 Not as successful as the other three dishes, this course did not feature the secret ingredient very well. The filet was difficult to cut into without a steak knife and the medium rare sear on the meat did not make it tender enough. A common complaint of cold dishes could be heard across the dining room. The goat cheese brulee was a quenelle of cheese hit with a blow torch for a few seconds, but not enough to make an impact on the cheese's flavor or melt-ability over the filet. The dark chocolate demi was barely detectable and made no impact on the dish itself. Although tasty, this dish did not score highly for creativity or execution. Words (almost) escape me about how creative this course was. Interactive meals are always intriguing and this was no different. Personally, I've always wanted to see a chef make a drink, a shot or a sauce I needed to pour over my dish to up the "wow" factor. This dish was almost there, but not quite. The leading lady of this dish was the white chocolate smoothie. It was too thick and too full of seeds to be sucked up the chocolate twirl straw but the intention was there. The round mound of genoise cake had good crumb and tasted okay but it was dry. Even though it was covered with a dark chocolate ganache and a chocolate cream, nothing could have saved the arid cake from Dessert Storm. At this point of the night, the score difference separating the two chefs was .06! each course was evenly matched. No one dish was clearly better than the other. It was going to be a close call. Soft like mousse, smooth like melted chocolate, the chocolate cream was a dream. The bottom was a very thin sponge cake that held it all together and I loved on every single bite. Sprinkled with a few large grains of sea salt, this dessert did not need it. It was already luxe. In regards to the almond crunch, I heard it was like having a layer similar to Twix or Snickers in the middle. In the end, it was Chef John Bobby who pushed it out and prevailed over Battle Mona Lisa Chocolate! 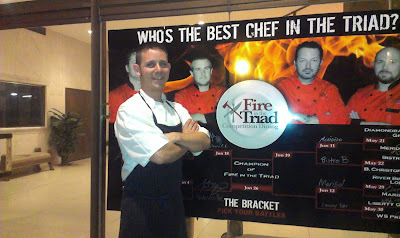 Who is the best chef in the Triad? I think this photo gives a small clue as to who it is. Thank you for another win for Winston-Salem! 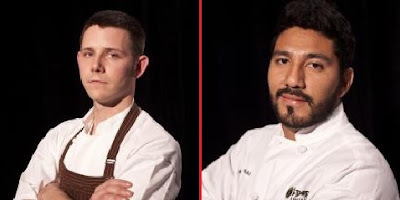 See Chef Bobby and Chef Gregory John of Greensboro Country Club battle it out in Kitchen Stadium The Empire Room on June 18! Buy your tickets TODAY because they are selling FAST! Visit Competition Dining for dish-by-chef photos, tickets and other information! The next Forsyth County battle begins Monday, June 11 between Mark Grohman of Meridian and Timothy Bocholis of Bistro B in Kernersville. Which locale will reign supreme? The Twin City? K-Vegas?